Each group after the initial group spawns when you close to within 14 km of the respective science vessel. You must loot a datacore from each of the three science vessels. Mission is complete when all drones are destroyed, so there is no blitz. Note: Science vessels can be looted (not salvaged) but cannot be tractored. Drone Bounties: Battleship class drones have bounties floating just under 1mil (881k to 993k isk). Loot: Huge amount of drone alloys (for a level 4 mission), approaching 2000 m³; also some Janitors and Scienitists. The rest of the report about the science vessel range / adds is accurate but there are no more spawns besides the initial and each science vessel based on time of any sort. 5 groups total show up in this mission - 2 initial and 3 at each vessel. If you can fit an AB, do so. Running from wreck to wreck takes a while. I popped everything, flew 3 jumps, typed some emails, dozed off for a few mins, came back and salvaged before turning it in - therefore I can confirm what PhinBu says that there are almost certainly no timed spawns. Spawns are proximity based, at somewhere between 10-16km on each vessel (apart from initial double spawn). Ran pretty easy in a beam Abaddon with 1Exp/1Kin/1EANM tank and half gank fit. Certain other drone missions I run 1Exp/1EANM, but this one might be a little too hairy for that. Done in Maelstrom with 800mm auto-cannons. Was very easy. Ranges listed above are accurate. 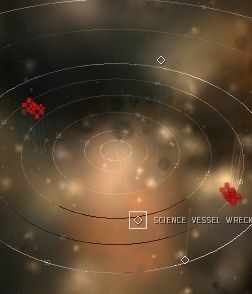 Each proximity spawn was at 11 km to the wrecks and consists of 3 battleships and 2 cruisers. Had my alt there in a Rattlesnake for extra dps and shield boosting if necessary. No repping was needed. Overall faily easy and good ore from reprocessing drone poo. The spawns may be 3 battleships and 3 cruisers. In either case it is still an easy mission. Ran in a T2 pulse Abaddon with AB and Exp/Kin hardeners. If you charge into every group you can wipe them all out with Multifrequency and drones before they get out of range or do too much damage. The AB also saves lots of time, the distances can be up to 70km. Done in T2 fitted, passive tanked Drake. Tanked safely but still groups have quite a DPS. For safety reasons I recommend to do it one by one and do not approach other wrecks before finishing with previous. Poor salvage but lot of alloys in loot. Completed easily with a AB fit Ishtar. Just orbited the science vessel wrecks @7500 while Ogre II's did the work. Didn't even need to use rep. Note: Tried sentries first and the incoming dps was too much.